What do the movies Red Planet, Mission to Mars, John Carter, and Mars Needs Moms have in common? Yes they have to do with Mars, but more importantly they were miserable box office failures. Sure some of them probably have their fans but with some rare exceptions (i.e. the original Total Recall) audiences just aren’t too interested in our red planetary cousin. The idea of going to Mars used to be cool when no one knew much about it, but once scientist probed the planet and discovered not much interesting there no one really seemed to car anymore. Even with something as significant as water being discovered there, I don’t think most people care that much. But finally, the movie gods have finally given us a fantastic cinematic version of Mars and only someone like Ridley Scott could make it happen. The Martian has been described as Apollo 13 meets Cast Away and I’d be hard pressed to come up with a more accurate description (though I’d throw Gravity into the mix as it shares similar themes). Returning to the sci-fi genre Ridley Scott gives us his first truly realistic science-fiction film. There are no aliens, creatures, or androids to be found here. What we do have is a rather impressive and likable performance from Matt Damon as astronaut and botanist Mark Watney. He’s part of the third manned mission to Mars but during a bad sand storm he’s mistakenly left behind when his crew believe him to be dead. Now he’s stranded alone millions of miles from Earth. Luckily, he’s practically a genius and we get to see him figure out how to survive on Mars’ desolate surface. Screenwriter Drew Goddard uses a smart script device by having Mark keep a video diary that informs us what he’s doing. While Gravity treaded similar territory about survival in outer space, The Martian actually cuts back to Earth to the scientists and engineers trying to bring him home (though they initially fear him dead). For a film that relies a lot on the charisma and standout performance of its lead actor, the film also features a tremendously eclectic supporting cast. Jessica Chastain, also in the space-themed Interstellar, is great here as the commander of the Aries III who ultimately makes the decision to leave Mars without Mark. Her crew is filled with familiar faces including Michael Pena, Sebastian Stan, and Kate Mara. Meanwhile, back on Earth the head of NASA is played by Jeff Daniels who has to make interesting decisions by announcing the death of Mark Watney and then following it up by telling the American public that he’s actually alive and living all alone on Mars. Others attempting to help bring Mark home include Sean Bean, Chiwetel Ejiofor, and a mostly underused Kristen Wiig. What feels most refreshing here, however, is the absence of cliched scenes of Mark’s concerned family; we don’t have any unnecessary or mawkish scenes of Mark's concerned wife looking helplessly through windows. There’s thankfully none of that unnecessary crap. Ridley Scott is the perfect guy to tell this story. Working on a sci-fi film that doesn’t consist of scares or creatures is a first for the director but he really sells the authenticity of it. This movie feels realistic. And that includes the mind-blowing shots sweeping above the Mars surface. This is a visually striking film that almost demands to be seen in three dimensions. And even though Mark is an extremely capable and resourceful guy, not everything goes exactly how he wants which eventually leads to some rather tense situations and a nail-biting final act. And to top it all off the film has a surprisingly fun sense of humor and a delightfully fun soundtrack. 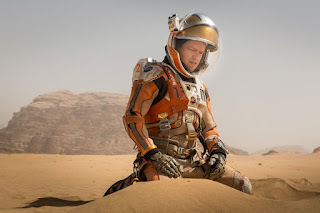 Theatrical Trailer for The Martian on TrailerAddict.